and starfish has been active and happy for the last week. Unsure of the cause or if this is signs of disintegration, and if so I'd like to know so I may remove it so it does not kill off my stock. My tank is 29 gallon half moon tank. and that it may heal over however, the starfish has positioned its self in this odd way and has been extremely sedentary today compared to its usual liveliness. Sorry, typo they said it could have been a bite from the snowflake eel who was messing with it. and I don't have access to hospital or quarantine tank to store it in while I'm observing it. I read that someone placed their starfish in a bucket to observe it. Is it doomed to die? Can it survive the night so I may place it in better care? info as possible so I know what to do. <Shea> Hope all is well. I need some info on an issue I am having with my African Red Knob Sea Star (Protoreaster linckii). I have noticed over the last few months that he seems to be fading in color on the red areas. I have had him for over a year and he has been fine. Seems to be behaving normally and eating. I just am not sure what could cause the change in the Red Knobs turning to a pinkish color. Do you know what this could be from. All param.s are good and my nitrates are now in the 20-25 range which is the best they have ever been since I have had him. Thanks for the help Mr. Fenner. P.S. I tore through your site but could not find anything similar but if you have a link to something on your site that would be great. Thanks. Shrimp/Starfish Compatibility 02/14/2008 Hello WWM crew! 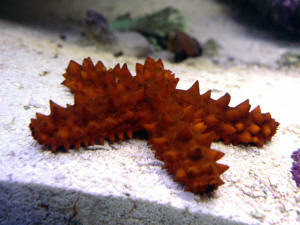 <<Hello, Andrew today>> I had a question about compatibility between my starfish and a scarlet skunk cleaner shrimp. I actually have two starfish, a chocolate chip and also a red knobbed in my FOWLR tank. This morning, I couldn't find the cleaner shrimp. Using a long net, I (gently) lifted up both stars and sure enough my chocolate chip had him. The shrimp was whole (no bites anywhere) and the star had him in his grips but the shrimp was mangled by any means, it was just dead. I don't know if the shrimp simply died during the night and the star was passing by and came upon a free meal, or if the star actually killed him. <<These are quite good eaters really and will prey on slow moving inverts. It could be possible that the shrimp was injured and could not move, already dead or just caught un-aware>> I haven't been able to find anything about chocolate chips eating shrimp, but before I get another I just wanted to make sure I wouldn't be adding it in vain.